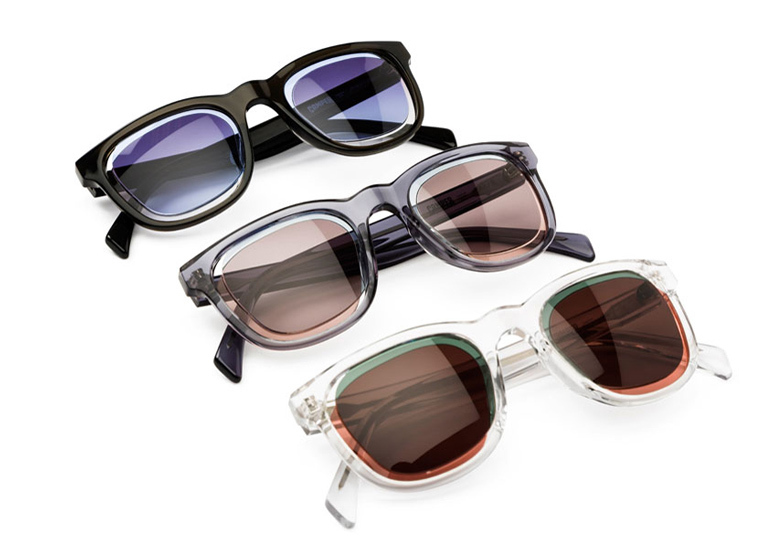 Japanese studio Nendo and Spanish shoe brand Camper have collaborated to create a range of sunglasses that feature overlapping coloured lenses. Eclipse, the first sunglasses by both Nendo and Camper, are tinted by combining the hues of two translucent polycarbonate lenses over each eye. Although Nendo has previously created a series of stores for the shoe company, this is only the second time the two have collaborated on a wearable design and follows on from their previous creation – shoes with laces threaded through the uppers. Each coloured lens in a pair of Eclipse sunglasses is fixed to opposite corners of the acetate frame, with one positioned over the other. The edges of the lenses create a line around the inside of the frame. "The lenses slide perfectly together without any space between them, thus avoiding any risk of air bubbles," said Nendo. The eyewear comes in three colour combinations: brown/grey, blue/gradient-black and red/green. The plastic frames for the three variations are translucent grey, opaque black and clear. Nendo has also designed the leather cases for the glasses and a lens-shaped cleaning cloth. Nendo's shop designs for Camper include a Camper Together branch in New York City lined with hundreds of white shoes.